THE CONTRAPTION DOESN’T HAVE A NAME, but it has a past. It’s small and lightweight, a simple leather-woven handle with two looping leather straps hanging from it, about a foot apart. Two buckles bring the straps’ loops together, tight enough to clasp and hold as many as four golf clubs by their shafts, running parallel to the handle. Perhaps more clubs could test the collective strength of the straps and buckles, but there’s no need for strain here. 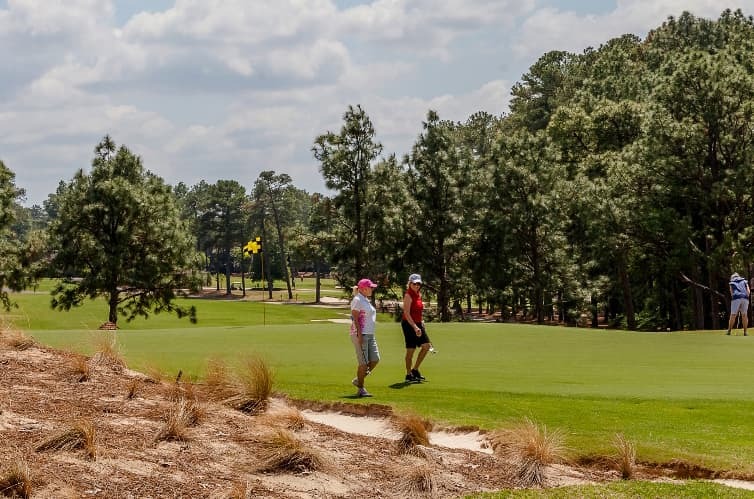 Not on The Cradle, Pinehurst’s new 789-yard short course. Four clubs are plenty for Darlind Davis, and after confidently draining a tricky 6-footer downhill, she’s even par through three holes. “I wish I could have scores like this all the time,” she calls to her playing partners as they head to the fourth tee. She’ll probably need her 8-iron on the fourth, a sloping 120-yard hole crossing the width of the Gil Hanse-designed course, which features nine holes ranging in lengths of 56 yards to the expanse – if you can call it that – of the fourth hole. Davis lays The Handle – that name seems appropriate – near the tee marker and unbuckles the straps, pulling the club she’ll need. There’s a delicateness to the process, and it quickly dawns on you that The Handle may not be all that efficient. The straps appear to be as strong as a fresh-out-of-the-box Wilson A2000, but they may in fact be older than Davis herself. Darlind Davis, holding The Handle, stands at the 2nd green of The Cradle. WALTER DAVIS LEARNED TO PLAY GOLF around his Navy days during World War II. He came home and became the head golf professional at what is now known as Indian Springs Golf & Country Club in Indiana, Pennsylvania. For 48 years, Davis ran the club. He was friends with Deacon Palmer, Arnold’s father, who lived about 20 miles away. Walter and the elder Palmer would share stories about trips each would take to Pinehurst way back when. Over a half century, Walter saw a lot in golf change. The game got faster, for one, especially when motorized golf carts began to come onto the scene. Walter, though, preferred to walk. Darlind doesn’t know how Walter got The Handle, but she remembers seeing him use it. “Some salesman probably talked him into it,” she says. But it fit Walter, and those evening walks around his course. When he passed away in 1981, Darlind made sure to get The Handle. There was really just one problem. When The Cradle opened last week, Darlind, a Pinehurst Country Club member, “tore the garage apart” to find The Handle. It took 50 years, but Pinehurst rekindled what Walter Davis had found most special about the game. Darlind Davis can walk a quick nine holes again, shoot scores she perhaps only dreamed of shooting, and carry only the clubs she needs. It just feels like she’s holding her dad’s hand at the same time.